Combine ServiceNow + Resolve for Amazing Automation. Discover faster, easier IT operations with a dynamic duo. 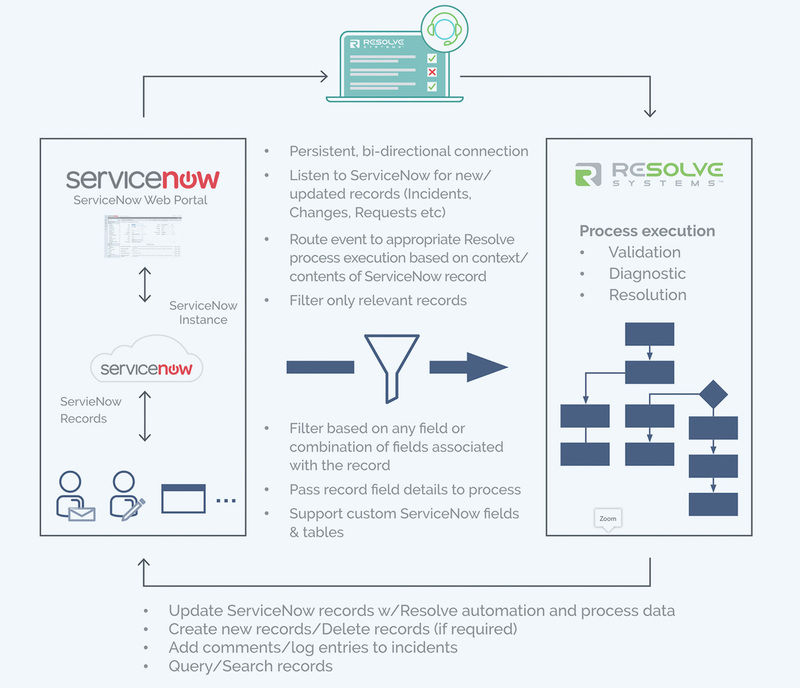 Resolve Systems and ServiceNow have partnered to offer a fully integrated solution for accelerating incident validation, diagnosis, and resolution. Resolve’s robust automation platform seamlessly integrates ticket data from ServiceNow with Resolve’s own powerful interactive automation, enabling IT operations staff to quickly validate, diagnose, and resolve incidents. No need to know how to code, no need to escalate. Fix Problems BEFORE Users Notice. 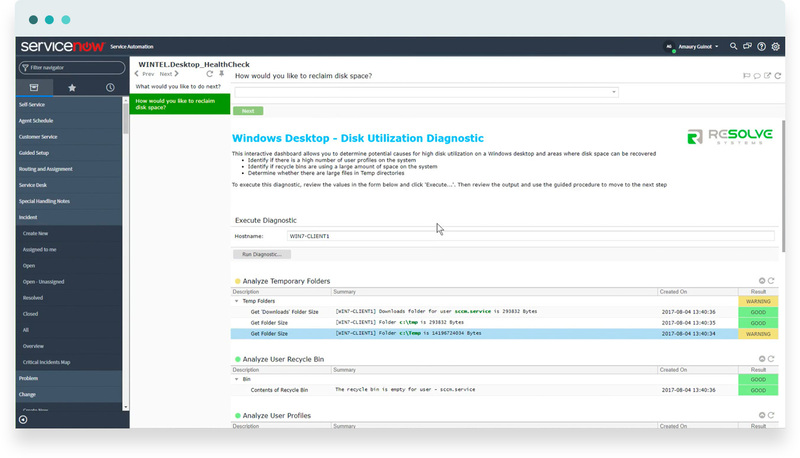 Automatically fix problems before they affect customers and reduce the time it takes to remediate incidents by automatically collecting diagnostic data and auto-remediating performance, configuration, and connectivity issues. Choose from 1000s of pre-built automations to kick off your automation journey fast. Reduce Time to Resolution. From hours to minutes. With automated validation and diagnostics, interactive process guidance and human-directed automation, agents have all the data, artifacts, and prescriptive instructions they need to resolve incidents in minutes instead of hours (or days). Give frontline agents the tools they need to resolve incidents without escalation. Incident resolution diagnostics provide automated test results and easy-to-follow troubleshooting guidance so frontline agents can safely resolve incidents without having direct access to critical systems. As a ServiceNow-certified app, Resolve’s platform integrates through the ServiceNow RESTful API. Resolve’s UI can be accessed directly from ServiceNow to help agents manage and quickly resolve issues and incidents. ServiceNow users invoke Resolve with just a single click within ServiceNow. Single sign on (SSO) is available to allow a user seamless access to both ServiceNow and Resolve. Set up real-time data sharing between the two systems. Resolve listens for new and updated records in ServiceNow (including Incident, Problem, Change, Service Request, CMDB, and custom tables), so when requests are submitted in ServiceNow, Resolve can trigger an automated task or process. Resolve can also create, update, search, or delete ServiceNow records in the course of automation execution.